Look more youthful and stylish with these super chic glasses for women - it's the perfect fashion accessory for the modern working woman. With a stylish high bridge, these glasses will help add a touch of style while defining your best features. Durability should always be one of your priorities when you look for new Versace VE3192B eyewear, which is why these plastic eyeglasses' frames are ideal. If you're the active and practical type, you'll benefit from having plastic frames. The thick fully rimmed frames are a real showstopper. You'll be able to let your personality shine through your Versace VE3192B eyewear with these unorthodox eyewear frames. Life's too short to be worrying about whether your eyewear suits you or not, which is why you can rest easy knowing you'll always look stunning in a pair of classic butterfly Versace VE3192B frames. These butterfly sunglasses will highlight your beauty and elegance and make you stand out from the rest, because the best statement you can make is with your eyes. Show the world you're smarter than the rest both in your intelligence and style. 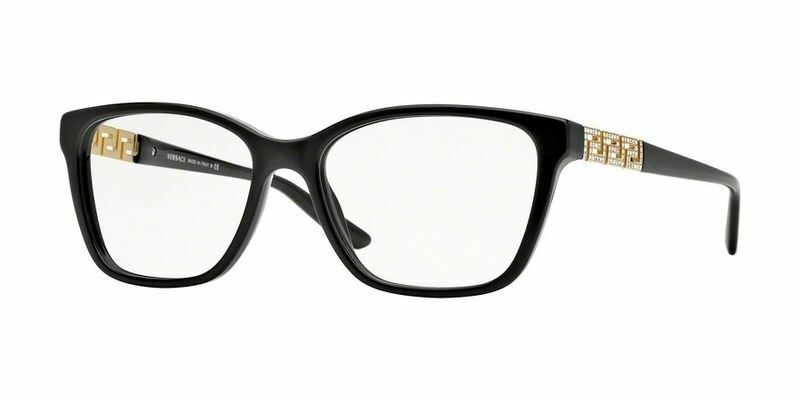 These nerd frames will epitomize your geek-chic style, helping you get the street-cred you deserve. For those of you, who have triangular-shaped faces, you should opt for top-heavy glasses with high temples such as these to bring about more of a balance. I love them since the first day I got them :) The quality is great . I would recommend anyone these eye glasses or this website.